What is the Civil Marriage Initiative? 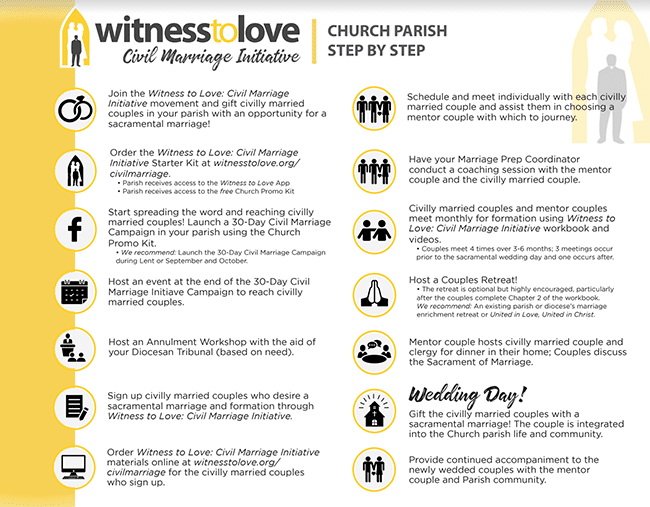 The Civil Marriage Initiative by Witness to Love is a comprehensive, revolutionary, nationally-researched and collaborative project. This project equips parishes and dioceses who desire to seek out, support, and inspire couples in civil unions to pursue transformative sacramental marriage formation. The Civil Marriage Initiative provides an experience that is personal, inviting, timely, engaging and allows a space for growth and formation in the Sacrament of Marriage for couples in civil unions seeking convalidation in the Catholic Church. The Civil Marriage Initiative is a revolutionary and integral aspect of evangelization and renewal in the Catholic Church today. There is no more important and urgent evangelization need than inviting civilly married catholics to receive formation for sacramental marriage. To date there has never been a collaborative grassroots effort to reach civilly married couples. This national, highly-researched initiative has been guided by diocesan leaders who sense the urgency of this outreach. 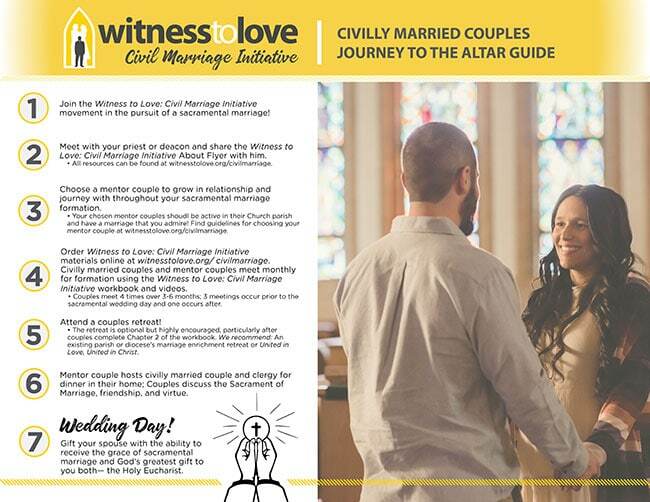 Churches who participate in this revolutionary outreach receive comprehensive training and marketing materials to invite couples in civil unions to receive sacramental marriage formation. Why does the Church today need a Civil Marriage Initiative? Approximately 20% of all sacramental marriages are convalidations. 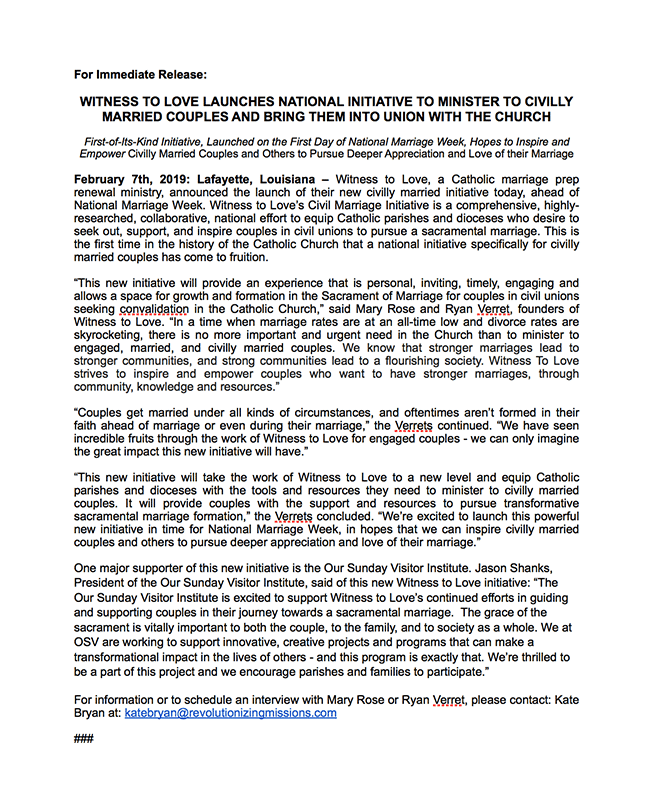 The Civil Marriage Initiative by Witness to Love is a national grassroots movement to change opinions and attitudes of baptized Catholics who choose to be civilly married rather than sacramentally married. We are drawing civilly married couples to understand the need for a sacramental marriage and to give them a path forward to receive the sacrament of marriage. Over time we noticed that many of our mentor couples had experienced convalidations and reported never receiving any marriage preparation until mentoring an engaged couple through Witness to Love. The feedback from these couples, regarding the impact this ministry had on their marriages, was profound and pivotal. We soon realized the need for the development of a new program — Witness to Love: Civil Marriage Initiative. Many dioceses around the nation also noticed a need. We heard from Witness to Love parishes and we heard the conversion stories from Witness to Love couples. We responded to the need. The fact is, the number of sacramental marriages among Baptized Catholics in the United States over the past fifteen years has plummeted due to many factors such as secularization, the breakdown of the family, and a lack of trust in the Catholic Church. The number of sacramental marriages dropped from 294,000 in 1995 to 144,000 in 2017, a decrease of 50%, even though the number of Catholics in the U.S. has almost doubled in that same time period. Witness to Love: Civil Marriage Initiative responds to the urgent need to reach those Baptized Catholics who have chosen to be civilly married rather than sacramentally married. The Church, until now, has not responded to the needs of this vast demographic who are the missing young families, the future families of the Church. What’s the story behind Witness to Love: Civil Marriage Initiative? It all began when we noticed that couples in civil unions were reaching out to us at Witness to Love at a point when they were trying to “save” or strengthen their marriage. We started using the Witness to Love process with those couples. We saw the fruit it was bearing in their conversion, involvement in the parish, and in their marriage. We began a process of interviewing civilly married couples who went through the traditional Witness to Love process in order to have their marriage blessed and got their feedback. We spoke with clergy and marriage prep coordinators at our Witness to Love parishes, and they all agreed that a program for couples in civil unions was a priority and an urgent need for marriage formation and for evangelization in the Church today. In January 2018, we were independently contacted by diocesan leaders from around the country, each of whom had been tasked by their bishop with finding ways to reach and form civilly married couples for sacramental marriage. Each leader was trying to tackle this need in their own diocese and wanted to collaborate. Ultimately, we decided to work with nine dioceses who were leaders in evangelization and had a desire to reach civilly married couples. Throughout 2018, we had regular, lengthy meetings with diocesan leaders, canon lawyers, civilly married couples, and clergy, to address a targeted outreach to civilly married couples and develop a unique formation process for them. From these conversations flowed everything we are now doing as part of this Witness to Love: Civil Marriage Initiative. From these months of research, dialogue, and collaboration a unique process has been created which includes resources, training, materials, and powerful videos specific to couples in civil unions who are seeking sacramental marriage. We interviewed and filmed couples who were civilly married and who went through the Witness to Love process to tell their story and give their witness about how sacramental grace has operated in their lives. Our Sunday Visitor got wind of the initiative we were undertaking, stepped in, and invited us to apply for a grant to reach unaffiliated millennials. We described to them what we were trying to do, the scope of the project, and the intended impact. They immediately saw this was one of the most urgent needs of the Church today and supported our efforts with a generous grant of $50,000 so that every Church parish in the United States could have the best possible resources for reaching and forming these civilly married couples. 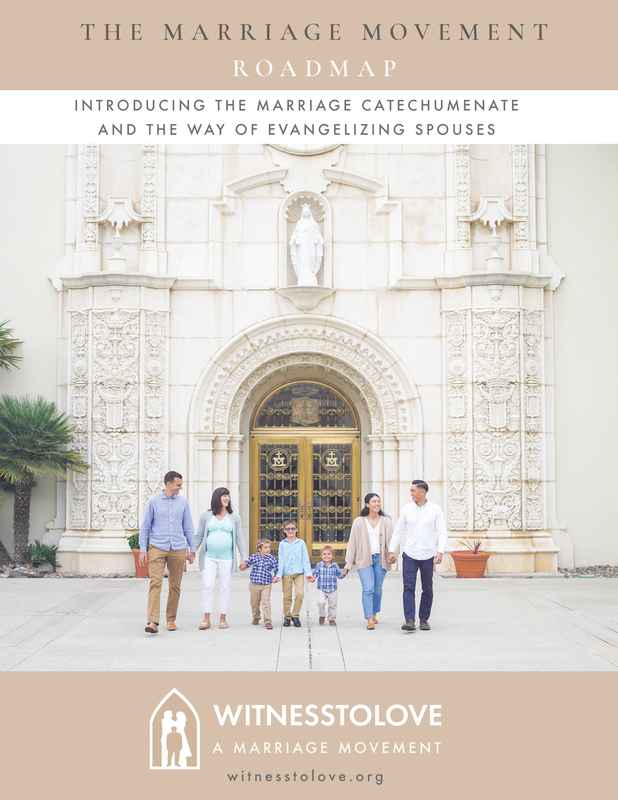 Based on our experience, we saw very early on that couples who were civilly married who came to the Church to have their marriage blessed, needed more than a few conversations and a blessing— they need what all the others needed: formation in virtue, accompaniment by a married couple they trusted and admired, and an invitation to a faith community. Those couples responded. Once we began inviting these couples to go through the Witness to Love process we found them even more responsive than the average engaged couple. They were seeking a sacrament, not just a venue. Do you know approximately how many convalidations take place in your church/parish each year? I am interested in Spanish materials. Witness to Love is thrilled to work with Our Sunday Visitor on this critical and timely project of serving couples. Never before has there been a national effort to reach and serve civilly married couples and create a process and a program just for them. OSV understands the needs of the Catholic Church today and we are so grateful that they have given to this initiative!